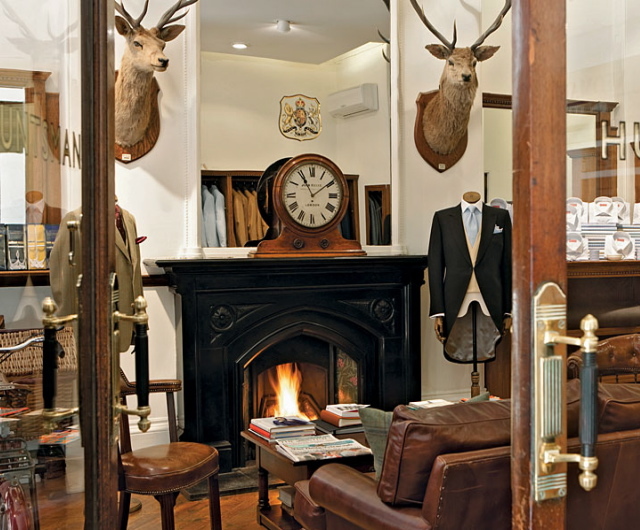 Here’s a peek inside the hallowed portals of Hunstman of Savile Row, established 1849. Over the decades Huntsman has made suits for the likes of the Prince of Wales (later Duke of Windsor), the Maharajah of Jaipur, Rudolph Valentino, Laurence Olivier, Clark Gable, Gregory Peck and painter Lucien Freud. The famed tailoring firm is undergoing some updates as part of the Row’s attempts to attract new customers. “Once widely regarded as one of the stuffiest companies on the Row – by itself, and proudly so – [Huntsman] has acknowledged that ‘you have to embrace new ideas or get left behind because younger customers want something different’”, its head cutter Patrick Murphy tells The National. Hopefully they won’t change a thing that we can see pictured here however. We can think of nothing better than whiling away an afternoon selecting a new three-piece by the fire. This entry was posted in Classics, Style and tagged bespoke, Gregory Peck, Huntsman, London, Savile Row, suits, tailoring. Bookmark the permalink.